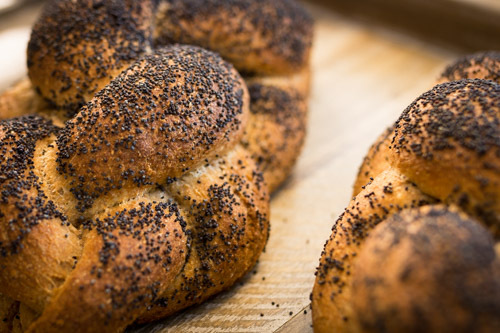 Golden Sesame Challah and Whole Wheat Poppy Seed Challah! 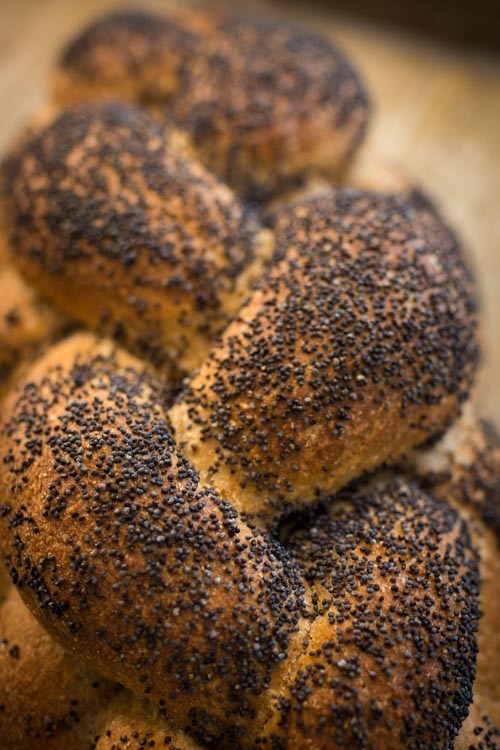 6 Pro tips and Techniques to Elevate You Challah Game! 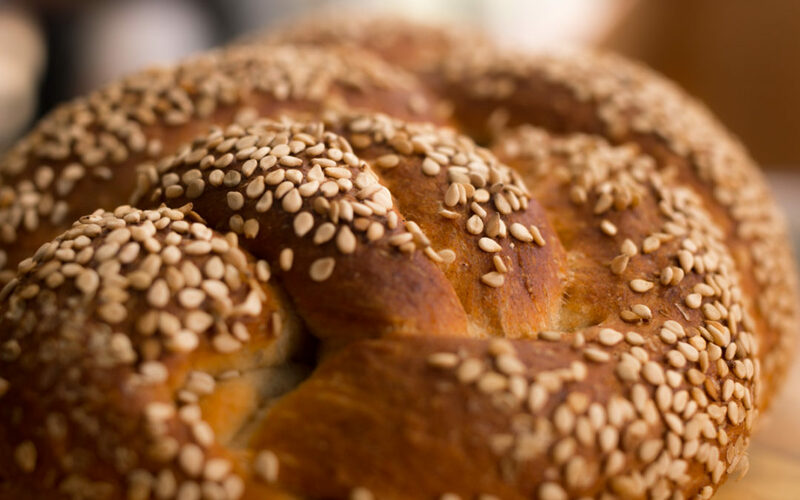 Those thick soft braids, creamy rich texture, and fresh yeasty bouquet are the hallmarks of a great challah. The keys to getting this dough right are getting the dough a bit stiffer than french dough(63-66% hydration instead of 67-70%) and to allow it to fully double after the first fold. The dough temperature really should be over 76 degrees otherwise the rise will take too long and you’ll likely end up shaping and baking it too soon. Keep it in a warm spot on cool days! Water should be about 100 degrees and butter needs to be melted first. Mix all ingredients together (dry first)thoroughly. Because this dough is a bit stiff you will need to work it with your hands to get all the ingredients mix properly. Knead it just long enough to get everything mixed well…about 1-2 minutes. Never add flour while kneading unless the dough is really too wet. Check dough temperature. It should be between 76 and 84 degrees. Leave in a warm spot(over 76 dergees) and fold after 45 minutes(I turn my oven on for 2 minutes then turn off and use it as a warm space). Allow dough to double in volume(about 45-90 minutes). Roll into braids into 12-14 inch tapered logs for Challah or stretch into 4 inch rounds for buns. 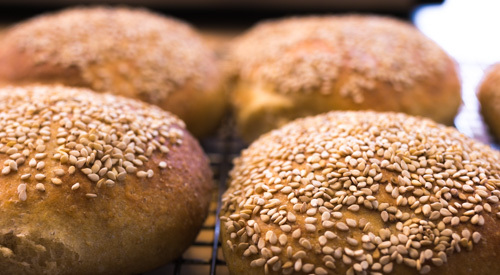 Buns can go right on a tray or rolled in seeds and then trayed up. Once braids are rolled into 12-14 inch tapered logs begin braiding. Braid any way you like! I am not going to teach braiding in this tutorial but a quick google search and you’ll find plenty of instructions. 3,4,5, or 6 strand braids work nicely. My personal favorite is six so that is what I use. 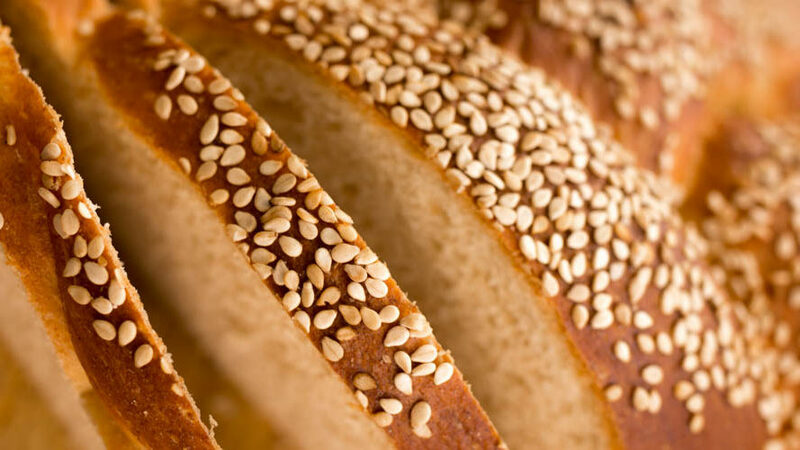 Brush with egg wash or water and top with sesame or poppy seeds. Cover and allow to fully double in size. 45-90 minutes depending on temperature. The warmer the dough the faster the rise. Once shaped allow to nearly double in volume…about 45 minutes if the dough is warm(over 76 degrees). If the dough is cool it could take a couple hours or more to finish rising. 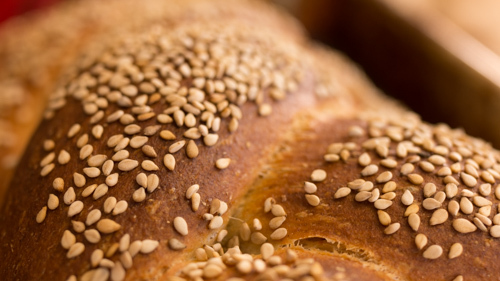 Load bread and toss 1/4 cup water into the bottom of the oven for steam. Close the door immediately after releasing water to trap the steam. bake for about another ten minutes or until the internal rtamperature of the bread is 200 degrees at the coolest spot. 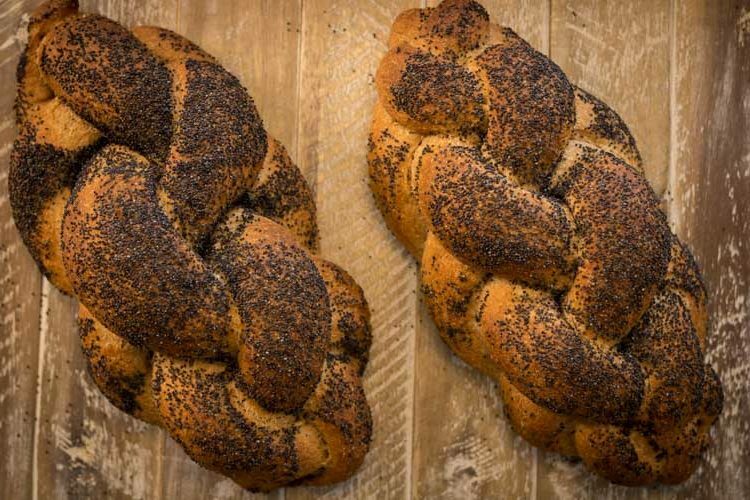 For years I made these buy the dozen in my bakery and find the six strand braid to be the most beautiful and fun to shape but you can braid it anyway you want or not at all and make this into a loaf pan. It also makes the best slider buns so make some extra dough and round up some extra 2 oz pieces to makes buns to keep in your freezer for instant perfect buns! Also as the bread stales after the first few days it makes the best french toast soaking up all the extra eggy goodness to make a perfect breakfast. Yet another reason to make extra. 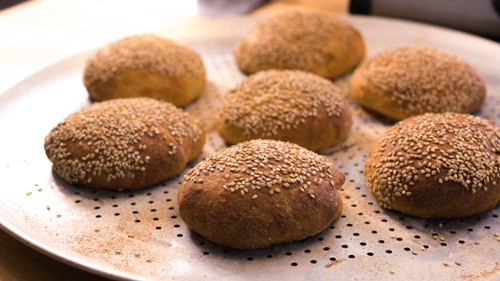 In this recipe I 2 lbs of dough makes one, 1lb loaf and a dozen slider buns. 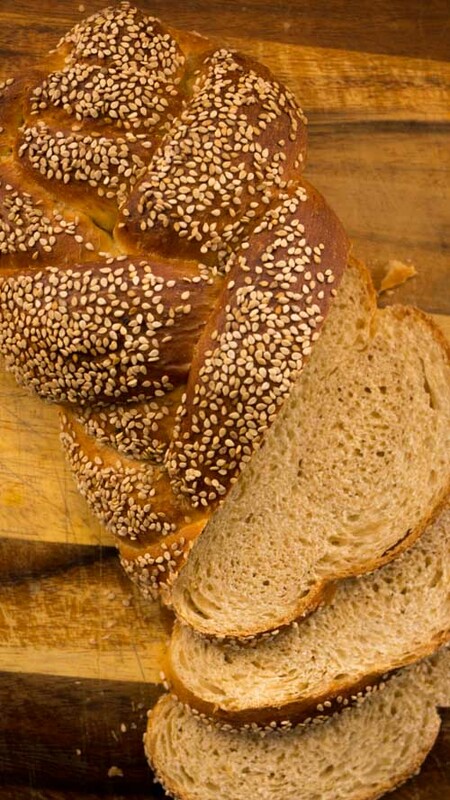 Or you could make one big braided loaf or a couple dozen buns…whatever fits your eating habits. Here I made a double batch of 4lbs and really loaded my freezer with buns for the ready. I recommend making a single batch the first time since it takes some extra timing and speed skills to make lots of buns and braids at a time but once you have this under your belt you’ll almost certainly need to make a double batch as this bread disappears like nothing else. 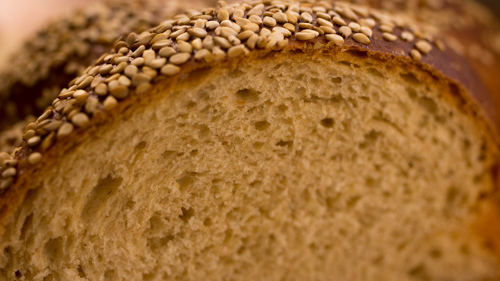 Below is the whole wheat version. I use butter for the fat component which of course is not parve but I butter. You can absolutely substitute your preferred oil. I didn’t use egg wash, which gives the classic shiny finish, so these are a bit more rustic looking. If you don’t use egg wash you need to steam the bake but either way works! These are the slider buns I made. You can also bake them smooshed together for the pull apart.